Auchentoshan is Gaelic, and translates into “The corner of the field”. 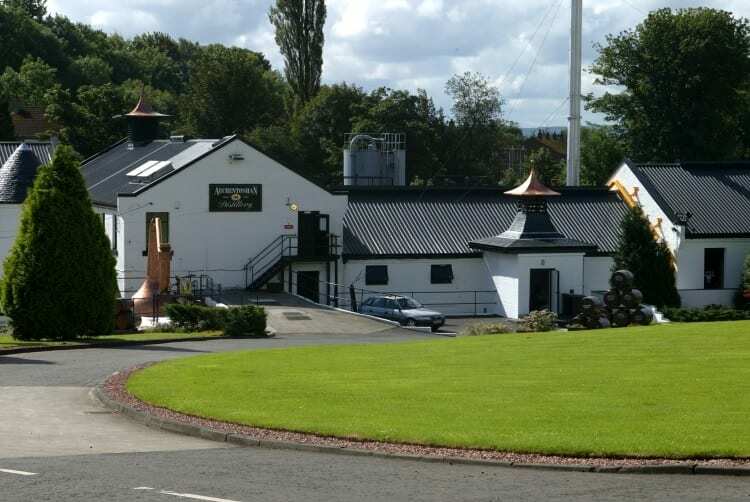 The distillery is located in the North-Western Lowlands, in Clydebank on the outskirts of Glasgow. Founded in 1823 (it had been operating before, but was granted the operating license in 1823) by John Bulloch, the distillery changed ownership quite a few times. During the war, the site was hit by a German Bomber, which destroyed most of the history of the distillery, as the archives were destroyed in the resulting fire. The crater caused by the bomb nowadays contains water, which is used by the distillery for cooling and condensing. All Auchentoshan whiskies are Triple Distilled, taking them up to 81% Alcohol By Volume at the end of the distillation cycle. This makes it the highest distillate of any single malt distillery in Scotland! The first distillation takes place as normal, in the Wash still. 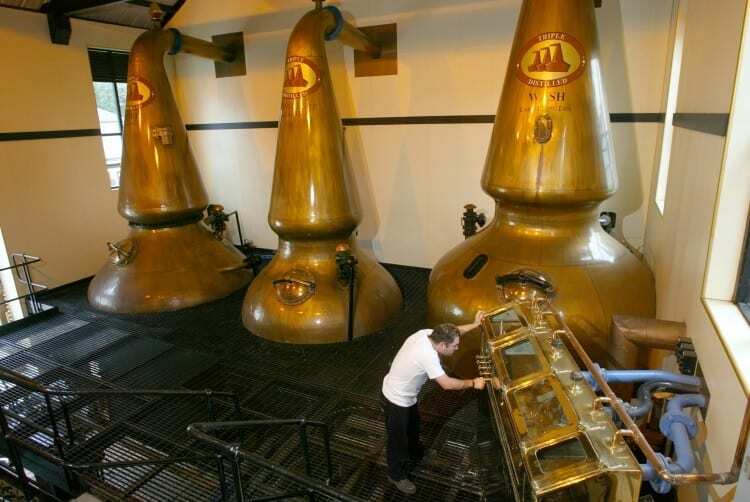 Auchentoshan employs the use of an 8,200 liters intermediate still, which is key to their triple distillation. In the intermediate still, the result at 19% ABV will be mixed with the last 10% (low tails) of the previous distillation in the intermediate still. The remainder of the intermediate distillation (at 55% ABV) will be fed to the spirit Still, where it will be mixed with 50% of the last distillation run of the spirit still. The triple distillation, apart from raising the alcohol level, also serves to remove impurities from the liquid, ending in fruity and citrus flavors. Classic – A triple distilled whisky, that matures in American Bourbon casks. Three Wood – This whisky starts off in American Bourbon casks, then moves to Spanish Oloroso Sherry casks, and finally is laid to rest in Pedro Ximenez Sherry casks. If you’re lucky, you might be able to find some of the Limited Edition Auchentoshan whiskies, which are indeed special treats. 1999 is another cask strength non-chill filtered spirit, but has been laid to rest in Bordeaux casks. 1974 was distilled in that year, and has matured in American Bourbon casks. 1975 was a production of 500 bottles, that slumbered in Oak barrels. 1979 is a spirit that has spent over 32 years in first-fill Sherrycasks, and then was bottled at cask strength.